The Associated Press is reporting that a new musical is in the works inspired by the tale “Sleeping Beauty”. Elephant Eye Theatricals says that singer-songwriter Regina Spektor will collaborate on the music on musical called “Beauty” . “Beauty” is described as a contemporary retelling of the Grimm fairy tale. It’s tentatively planned for the 2011-2012 Broadway season. “Beauty” will feature book and direction by Tina Landau and lyrics by Michael Korie. The popular 60’s television series, The Addams Family is following the tradition of many telvision and movie franchises as the latest popular series to be adapted into a Broadway Musical. Known for it’s catchy theme song lyrics, which can no doubt be sung in an instant by any one over the age of 40, the franchise has been kept alive through reruns in syndication, in Halloween costume shops and in the 90s with two theatrical releases. The musical, set to open in Chicago for a run in November before heading to Broadway, will star two-time Tony winners Nathan Lane (The Producers, A Funny Thing Happened On The Way To The Forum) and Bebe Neuwirth (Chicago, Sweet Charity) as Gomez and Morticia, respectively. The Ricardo Montalban Theatre hosts a production of Luisa Fernanda. Federico Moreno Torroba’s 1932 show is one of the last and greatest examples of the zarzuela, a traditional Spanish form which blends operatic grandeur with dramatic musical theatre. 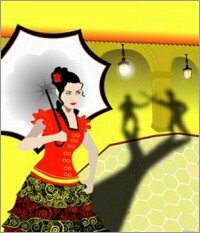 Luisa Fernanda tells a story of romance set against the backdrop of the popular 1868 uprising against the Queen of Spain.